Our traditional solid Elm hardwood flooring is supplied unfinished for on site sanding and sealing. 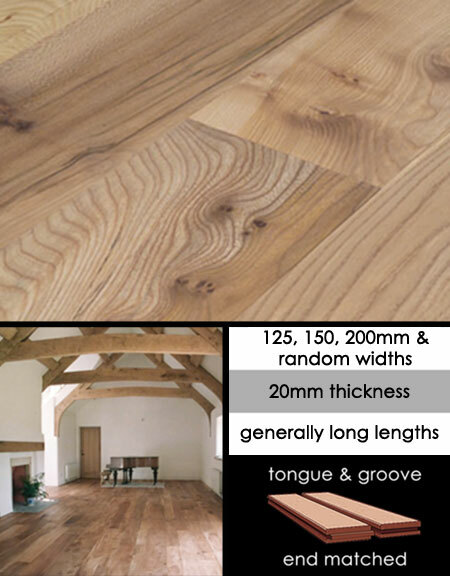 We can supply Elm wood flooring in widths of 125mm wide x 20 mm thickness, with the majority of floorboards being long random lengths. On occasions we can offer alternative board widths, as well as random width flooring, but this is timber dependant, please ring for supply updates. All our Elm wood flooring is kiln dried and has a tongue and groove on all 4 sides. * Unfinished for traditional hand finish installation. * Tongue and grooves on all 4 edges. * Our wood flooring is kiln dried. * Timber plank widths of 125mm x 20mm thickness. * Other flooring widths occasionally available. * Tel 01722 415000 for extra information.